It wouldn't loss if you to install these applications, easily and have a small capacity. 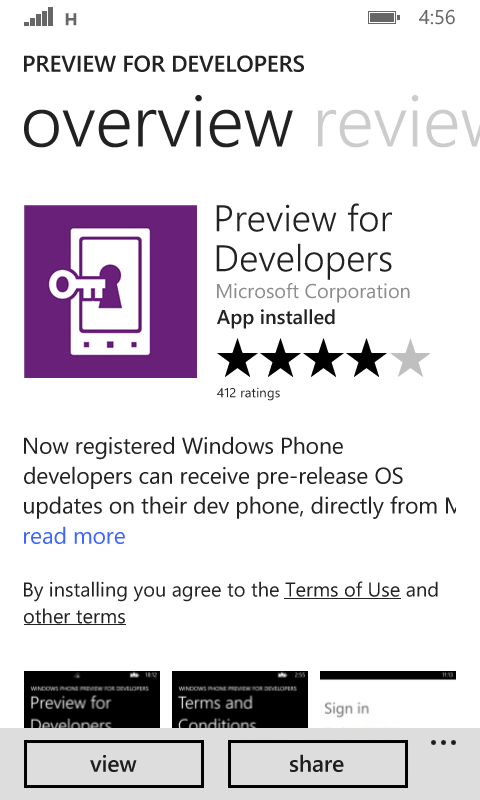 Simply search in the Windows store on your windows mobile phone, just type "preview" and you can get it the application. This application is usefull because these can give you some additional features of the application without you asking. In fact, the application of which is damaged or in error can be fixed by itself. This application can also be used as bait windows phone software upgrades via the internet without using a PC. If you want upgrade Windows, provided that the condition has a battery capacity of at least 30% This, do to avoid damaged or corrupt Data while downloading new software and installation of software. If this is not done (Battery under 30%) your phone will Risk, with softbricking. So, before an increase in software do, best of contents battery capacity up to full (100%) in order to increase the security of Windows phone Software. Sign up for a preview of thedevelopers using the microsoft Account ... can use the windows account store. If it is already in the Application, download the Preview receipt of depeloper in windows and run the Application. Then you just follow the instruction: Next> Accept> Login with your Account> Done(Thick: Enable Preview of Developer)> Done(SUCCESS) . If it is successful, you just update only. This mark with the readings: : "You'll receive early access to the latest updates by enebling the review on your phone". The next software Update, can enter the main Menu: All setting> Phone update> Check for update. You are on the website page WINDOWS MOBILE PHONE - setting and Upgrade. Preview of developer With the link URL http://hand-uk.blogspot.com/2015/02/preview-of-developer.html for this articles, you can bookmark or share to any. Our expectation that Windows smart phone users, can understand and know about OS Windows phone. Preview of developer Is a link for you, How to use the pure smart phone.